Potential, new Bay Bridge locations. Across the peninsulas of western Talbot County? That is insane. My dad will have something to say about that as he lives there. I don't know why MDTA even published them, but they are going to make a lot of people angry. From the western shore, across to Tilghman Island, then across the Choptank waters to Oxford? Beltway, that looks like DC's Big Dig. If DC were to have a Big Dig, I-95 should be rerouted off I-495. Talk to Doug Willinger (I think that’s his name). His website has advocated this for years, though of course it’s a pipe dream. The growth of the area will happen, the feds need the bridge, they will probably build it no matter what anyone says, they just wanna find the right location. 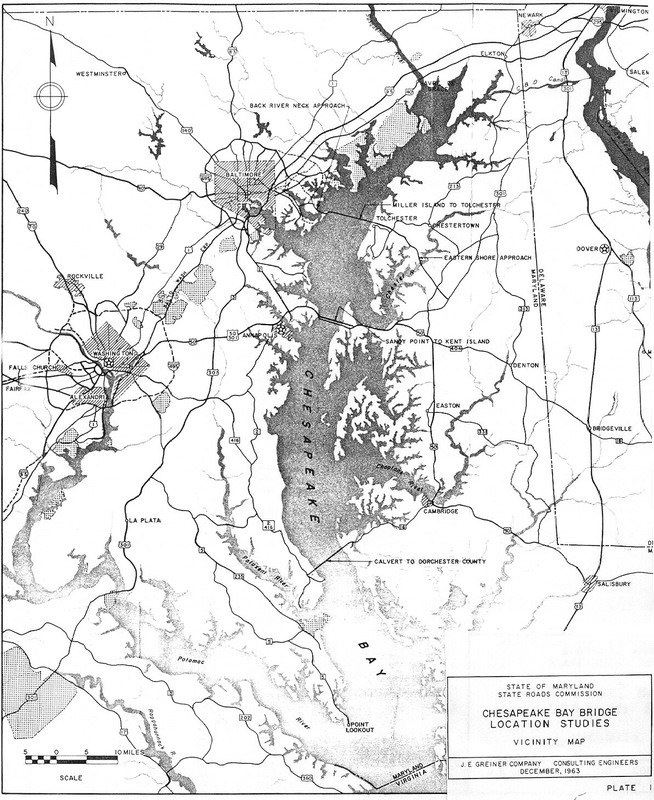 It's worth noting that two of the corridors on that Chesapeake Bay map (#4 and #12 specifically) were studied in the past but discarded in favor of building what is now the westbound Bay Bridge span. The State Roads Commission did evaluate all 3 locations in 1964 for where to build the next bay bridge, with the Sandy Point location being the selection, but while I don't know the exact year, the northern and southern crossings remained in long range planning for at least 5 years after the parallel bridge opened in 1973. Those would still be the logical places to build the northern and southern crossings, the width of the bay and connections to existing highways being the factor on the southern, and the problem of crossing military lands on the northern. Is MD 213 via Liberty St in Centreville going to be permanent, or is this just temporary during construction? Saw this for MD-295. Looks like the original signage will all go away. And a look at GSV on US-40 over the Endmonson Ave Bridge shows this sign is gone too and on the contractor website it also says new signage. So I'm guessing all the button copy associated with the interchange will be gone by the end of 2020. Another intersection to be replaced with a super street setup on US 15 in Emmitsburg. There are still some cross-traffic intersections left. But they are being eliminated over time. This project is near Mt. St. Mary's Univ. and the Grotto of Lourdes. U.S. 15 already has a j-turn further north at Annandale Rd./College Ln., and one still further north at South Seton Ave./Old Frederick Rd. A new traffic signal has been installed near the New Carrollton Metro station and an off-ramp from US-50 WB (John Hanson Hwy), and part of it has a function I don't quite understand. The signal serves a simple T-intersection between a road leading to/from a new office building adjacent to the station, and a one-way section of Garden City Drive. But there's also a twist -- there are also signal heads facing the tight-curve off-ramp from US-50, and these seem to only flash yellow. And it's the center yellow lens that flashes, not a R-Y-FY setup. (It appears to have the usual R-Y-G lenses present.) The off-ramp has two continuous lanes, and they don't appear to interfere with the T-intersection, so does anyone know what that signal face is there for? I wouldn't know because I'm not there, but from what you described, my guess would be a future signal currently in flash mode. It could become active in the future with that new office building. Does he still run the Takoma Park Highway Design Studio? The first weekend closure of state Route 213 at Gravel Run on the north end of Centreville is set for March 29, weather permitting. The closure is necessary to assemble and place the temporary “jump bridge” that will keep traffic moving while crews repair the bridge substructure and replace the bridge deck this spring, said Bob Rager, SHA community liaison. The March 29-April 1 closure is the first of four possible weekend closures needed at the Gravel Run location. According to the project page the widening of MD 32 between MD 108 and Linden Church Road is scheduled for completion this summer. Once this is done, the next big project to the north is already in progress and will hopefully not be delayed any further. I will be curious to see how backed up MD 32 north becomes at MD 144/I-70 once the current widening is completed. The Interstate number makes sense - spur route into downtown. Why sign that one, where many others go unsigned? I don't think there's a great answer for that. MD even signed I-170 for the few years that lived. The only one they don't sign is I-595 due to route concurrencies (50/301), so maybe it's just MD policy to sign every route they have. That is the nature of Interstate spur routes, they connect a mainline Interstate route to a local destination such as a central business district in this case. It was part of the original Interstate highway system and by its inclusion it got 90% federal funding at a time that almost no non-Interstate project got more than 50%. It was justified to be an Interstate project by the fact that it connects I-95 to the CBD. Very expensive construction to build an elevated bridge structure like that, it's good that it got that level of funding to better help the state to afford to build it. It was part of the original Interstate highway system and by its inclusion it got 90% federal funding almost no non-Interstate project got more than 50%. It was justified to be an Interstate project by the fact that it connects I-95 to the CBD. I think it is no more complicated than that it was part of the 3-A Interstate and Boulevard System that was approved in 1968 and was funded and designated as a spur Interstate route I-395 from that point onward until it was completed in 1982. It used some of the right-of-way that was already acquired for I-95 in the previous 10-D Expressway System concept. If I-70 and I-170 had been completed then they would have had those two designations. They were also part of the 3-A Interstate and Boulevard System. Cashless toll conversions are beginning in Maryland this fall, starting with the Hatem & Key Bridges. Both have 80% or higher E-ZPass usage.